A guide advising healthcare professionals on the best language to use when communicating with people with diabetes has been published by NHS England. 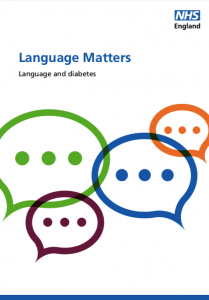 The publication Language Matters: Language and Diabetes aims to reduce any potential negativity from doctors and nurses in interactions with people living by providing practical guidance. It includes examples of the most appropriate language to use, with alternatives from unhelpful comments suggested to avoid any negativism and encourage positive interactions. The examples are based on research and supported by a simple set of principles. The document sets out the principles for good practice for interactions between healthcare professionals and people living with diabetes, drawn up with reference to the experience of people who have diabetes, healthcare professionals and published research. Dr Partha Kar, associate clinical director for diabetes at NHS England, said: “Diabetes care is changing – and if we as healthcare professionals want to make a difference, it is the building of relationships and relationships and respect which places the patient at the heart of that change which will take it to the next stage. We need to be trusted guides in the journey of those living day in, day out with diabetes. Writing in the document, Anne Cooper, who lives with type 1 diabetes, and Bob Swindell, who lives with type 2 diabetes, said in a joint introduction: “The language used by healthcare professionals can have a profound impact on how people living with diabetes, and those who care for them, experience their condition and feel about living with it day-to-day. At its best, good use of language; verbal, written and non-verbal (body language) which is more inclusive and values based, can lower anxiety, build confidence, educate and help to improve self-care.